The crowds at The Arcade’s December round are thinning out – make sure you stop in and get our 2014 Advent Calendar and play the gatcha for all 12 keys and the fabulous holiday prizes that await inside! 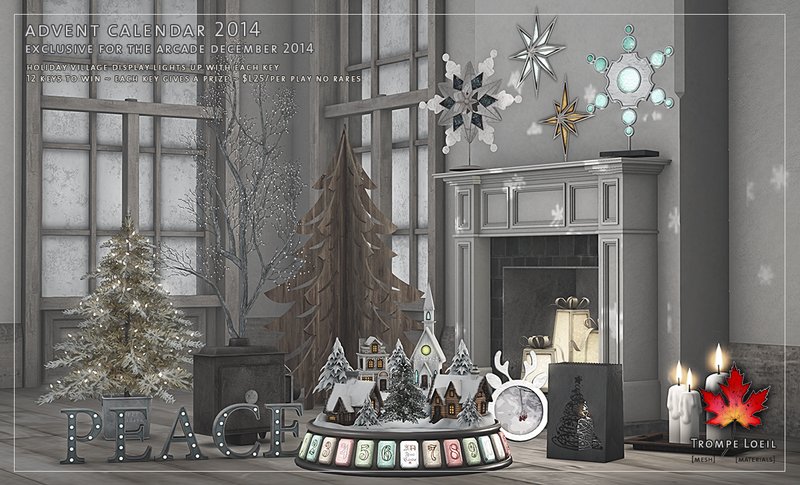 This year’s Advent Calendar is a full village display that makes the perfect holiday centerpiece – grab it for free at the board in front of the gatcha machine, or at our Mainstore. Play the gatcha – only $L25 per play and no rares – to get all 12 keys that light up the corresponding number on the display and light up the town. Each key gives you a mod/transfer holiday decor gift as well! From stand-alone snowflakes to lanterns, three different trees and a projector that casts snowflakes on your wall (projection lighting must be enabled), this year’s selection of prizes are our most fashionable yet! Head to The Arcade before December 31st to win the entire collection!